See an article on this from space.com here. 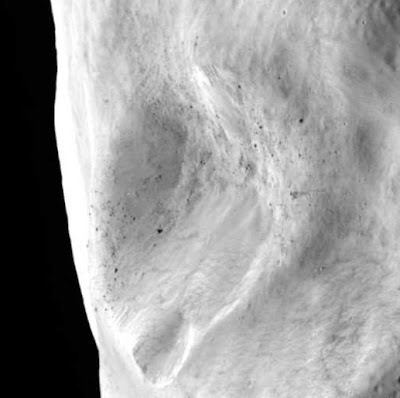 The idea of a landslide on an asteroid seems pretty hard to believe at first, but that's simply because (in my opinion) articles on bodies such as these never bother to mention surface area along with diameter, making it very hard to imagine just what it would be like to be on the surface of one of them. With a diameter of 100 km though, 21 Lutetia has a surface area of some 32,000 km2, which is equivalent to Belgium, or Maryland. One other easy way to imagine the surface is simply by using circumference, and with a circumference of 315 km it would take about ten days to walk around it once, returning to where you started. Of course, with its tiny gravity (1/200th that of Earth) walking wouldn't be the same at all so it would be more a matter of leaping from one point to another, though escape velocity is still 280 kph so one couldn't simply float away.